We are offering Groove Welcome Display Board to our clients. 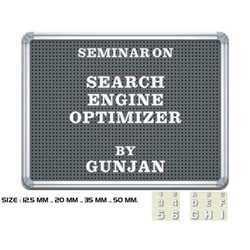 This kind of boards are generally use as a welcome board at reception counter of hotels, restaraunts, customer longe etc. The frame of board is golden type coating. colour of this board is red. 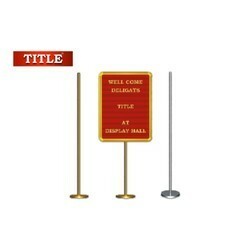 For display the writing matter you can use a golden coated latters and figures. A stand for this boards is also available. We can also make tailoring size boards. We are offering Black Perforated Display Board to our clients. We are offering Reception Board Stand to our clients. 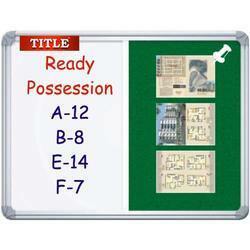 We are offering Combination Display Board to our clients. 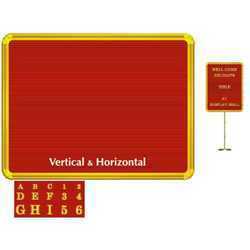 Looking for Display Board ?